For the first time in nearly 20 years, Smashing Pumpkins founding members Billy Corgan, Jimmy Chamberlin and James Iha perform together again – they will be hitting the road this summer on the Shiny and Oh So Bright Tour! 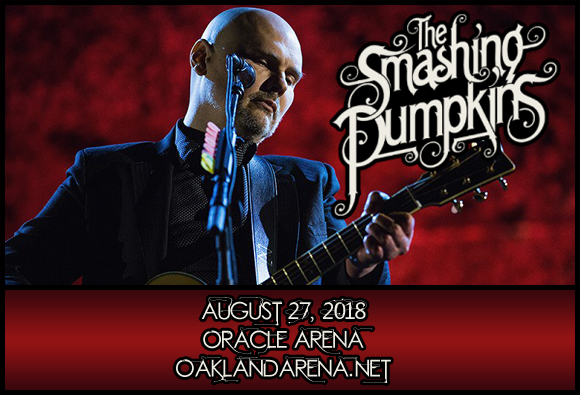 The group, which celebrates its 30th anniversary this year, will bring the tour to Oracle Arena on Monday 27th August 2018, presenting Smashing Pumpkins' musical journey over the years with hits like "Bullet With Butterfly Wings", "1979" and "Tonight, Tonight"! American alt-rock band Smashing Pumpkins was one of the most commercially successful and critically acclaimed bands of the 1990s, coming to prominence with their 1993 album Siamese Dream. Two years later, their follow-up, Mellon Collie and the Infinite Sadness, debuted at number one on the Billboard 200 album chart and launched the album's lead single, "Bullet with Butterfly Wings", which also debuted at number one on the US Billboard 200. The album was eventually certified diamond by the RIAA. To date, the band has released nine studio albums, four live albums, one digital live album series, seven compilation albums (including box sets and promotional releases) and five EPs. In 2018, after several line-up changes over the years, original band members Jimmy Chamberlin and James Iha officially rejoined the band.